Recently, one of my co-workers saw this blog and decided I could definitely contribute to this years company Christmas Party. On one of her shopping excursions, she found a "Cookie Tree Kit" produced by Wilton. 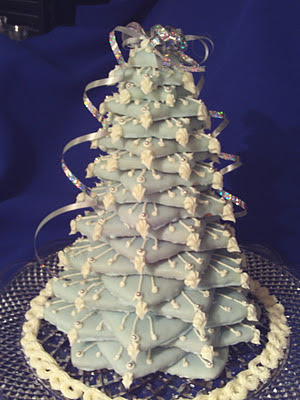 It was a set of 10 plastic star-shaped cookie cutters in graduated sizes from small to large, along with two decorating tips, 2 plastic piping bags and a booklet of recipes and instructions for each of the trees pictured on the package. I had never seen this kit (which surprised me because I am a frequent visitor to the Wilton website) and was certainly up for the challenge. The kit had several design ideas on the package and my co-worker had already picked out the design she wanted. I was told to make it blue, white and silver (or any combination of the three colors) so the tree would coordinate with the decorations. I knew just by looking at the picture that I would need to make this tree in stages. Baking, icing, stacking and icing again. This was fine because my regular work day begins at 7:30 am and ends at 7 pm. That doesn't leave a lot of time to play around in the kitchen. The party was to be held on Saturday evening. The Monday before the party, I pulled out the Cookie Tree Kit and read over everything. When you are told to read over all the instructions carefully, it's for a reason. I should have read over the instructions twice. The booklet contains 2 recipes for the Cookie Tree. One for sugar cookies and the other for gingerbread cookies. I needed sugar cookies for the tree I was to make. It turns out you need to make 2 batches of the sugar cookie recipe to make one tree (the same thing goes for the gingerbread cookie recipe if you plan to make that one). This would normally not be a problem, but, as I stated earlier, this was Monday. My husband had just come back from the grocery store, it was 9 o'clock at night and I realized I needed another 2 sticks of butter to even begin making the cookies! I didn't get started on this project until Wednesday night and it took a combined total of 6 hours to complete (not including cooling and drying time). This is definitely not a last minute project. You could, however, try making the gelatin tree or crisped rice tree in less time. Instructions for these two items are also included in the kit. I made the blue icing a poured it over the cookies. It dried with a nice shiny coating. I then piped each cookie with a white criss-cross star and stacked them on top of each other. You need to be sure the cookies are evenly stacked to keep the tree from toppling over. I placed a dab of icing in the center of each cookie to act as "glue" for the one above it. To finish, I used a star decorating tip to pipe "snow" on the tips of each cookie. The I placed a silver dragee on the top of the "snow". A simple silver bow with ribbon curling down finished the tree. It was beautiful! It took awhile for people to start eating the cookie tree, but when we finally did, it tasted great, too! It turnes out wonderful and tasted great too.